Researchers consider that the first search engine was Archie, created in 1990by Alan Emtage, a student at McGill University in Montreal, Canada. Marc Andreessen founded Netscape. In 1993, he had already developed Mosaic, the first Web browser with a GUI. It was once considered a letter in the English language. The Chinese call it a little mouse, Danes and Swedes call it 'elephant's trunk', Germans a spider monkey, and Italians a snail. Israelis pronounce it 'strudels' and the Czechs say 'rollmops's...What is it? The @ sign. In the Deep Web, the part of the Web not currently catalogued by search engines, public information said to be 500 times larger than on the WWW. Tim Berners-Lee predicted in 2002 that the Semantic Web would "foster global collaborations among people with diverse cultural perspectives", but the project never seems to have really taken off. The top visited websites in February2004, including affiliated sites, were Yahoo!, MSN, the Warner Network, EBay, Google, Lycos and About.com. The search engine "Lycos" is named for Lycosidae, the Latin name for the wolf spider family. The US International Broadcasting Bureau created a proxy service to allow Chinese, Iraians and other 'oppressed' people to circumvent their national firewalls, relaying forbidden pages behind silicon curtains. Lurking is to read through mailing lists or news groups and get a feel of the topic before posting one's own messages. SRS stands for Shared Registry Server. The central system for all accredited registrars to access, register and control domain names. WAIS stands for 'Wide Area Information Servers' - a commercial software package that allow the indexing of huge quantities of information, the makes those indices searchable across the Internet. An anonymiser is a privacy service that allows a user to visit Web sites without allowing anyone to gather information about which sites they visit. Archie is an information system offering an electronic directory service for locating information residing on anonymous FTP sites. On the Internet, a 'bastion host' is the only host computer that a company allows to be addressed directly from the public network. 'Carnivore' is the Internet surveillance system developed by the US Federal Bureau of Investigation (FBI), who developed it to monitor the electronic transmissions of criminal suspects. Did you know that the original URL of Yahoo! was http://akebono.stanford.edu/ ? Developed at the University of Nevada, Veronica is a constantly updated database of teh names of almost every menu item on thousands of gopher servers. The Electrohippies Collective is an international group of 'hacktivists' based in Oxfordshire, England. UIML (User Interface Markup Language) is a descriptive language that lets you create a Web page that can be sent to any kind of interface device. In Internet terminology, a demo is a non-interactive multimedia presentation, the computer world's equivalent of a music video. Did you know that the name of the famous search engine AltaVista came into existence when someone accidentally read and suggested the word 'Vista' on an unclean whiteboard as 'Alta Vista'? Boeing was the first airline to discover the Y2K problem, way back in 1993. Did you know that Domain registration was free until an announcement by the NAtional Science Foundation on 14th September, 1995, changed it? The Internet was initially called the 'Galactic network' in memos written by MIT's J C R Licklider in 1962. Shokyu Ishiko, a doctorate in agriculture and chief priest of Daioh Temple in Kyoto has created an online virtual temple which will perform memorial services for lost information. A 55 kg laddu was made for Lord Venkateswara at Trumala as a Y2K prayer offering. The morning after Internet Explorer 4 was released, certain mischievous Microsoft workers left a 10 by 12 foot letter 'e' and a balloon with the message, "We love you", on Netscape front lawn. If you were a resident of Tongo, a monarchy in the southwest Pacific, you could own domains as cool as 'mail.to' and 'head.to'. The American Registry for Internet Numbers (ARIN) began the administration of Internet IP address in North and South America in MArch 1998. The testbed for the Internet's new addressing system, IPv6, is called the 6bone. The first Internet worm was created by Robert T.Morris, Jr, and attacked more than 6000 Internet hosts. The French Culture Ministry has banned the word 'e-mail' in all government ministries, documents, publications and Web sites, because 'e-mail' is an English word. They prefer to use the term 'courriel'. The German police sell used patrol cars over the Internet, because earlier auctions fetched low prices and only a few people ever showed up. Rob Glasser's company, Progressive Networks, launched the RealAudio system on April 10, 1995. 'Broswer safe colours' refer to the 216 colours that are rendered the same way in both the PC and Mac operating systems. Though the world Wide Web was born in 1989 at CERN in Switzerland, CERN is mainly involved in research for particle physics. The first computer company to register for a domain name was Digital Equipment Corporation. The 'Dilbert Zone' Web site was the first syndicated comic strip site available on the Internet. Butler Jeeves of the Internet site AskJeeves.com made its debut as a large helium balloon in the Macy's Thanksgiving Day parade in 2000. Sun Microsystems sponsors NetDay, an effort to wire American public schools to the Internet, with help from the US government. In Beijing, the Internet community has coined the word 'Chortal' as a shortened version of 'Chinese portal'. Telnet is one of the oldest forms of Internet connections. 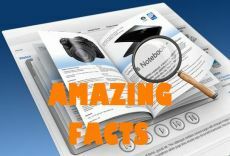 Today, it is used primarily to access online databases. Domain names can be really sell at high prices! The most expensive domain name was 'business.com', which was bought by eCompanies for $7.5 million in 1999. The first ever ISP was CompuServe. It still exists, under AOL Time Warner. On an average, each person receives 26.4 e-mails a day. Ray Tomlinson, a scientist from Cambrige, introduced electronic mail in 1972. He used the @ to distinguish between the sender's name and network name in the e-mail address. Transmission Control Protocol/Internet Protocol (TCP/IP) was designed in 1973. The Apple iTunes music store was introduced in the spring of 2003. It allows people to download songs for an affordable 99 cents each. Satyam Online become the first private ISP in December 1998 to offer Internet connections in India. The Internet is the third-most used advertising medium in the world, closely catching up with traditional local newspapers and Yellow Pages. As of now, there are over 260 million people with Internet access worldwide. 1 out of 6 people used the Internet in North America and Europe, as per a 1999 survey. An estimated 2.5 billion hours were wasted online last year as people waited for pages to download, according to a study sponsored by Nortel Networks. AOL says spam is the number one complaint of its customers, and that it has to block over one billion unsolicited e-mails every day. In 2002, the average Internet user received 3.7 spam messages per day. The total rose to 6.2 spam messages per day in 2002. By 2007, it is expected to reach 830 messages per day. A terminology industry research firm called Basex says that unsolicited e-mail cost $ 20 billion in lost time and expenses worldwide in 2000. In 2003 an Atlanta- base ISP called Earthlink won a lawsuit worth $16.4 million (US) against a spammer in Buffalo NY, and a $25 million (US) lawsuit against a spammer in Tennessee.